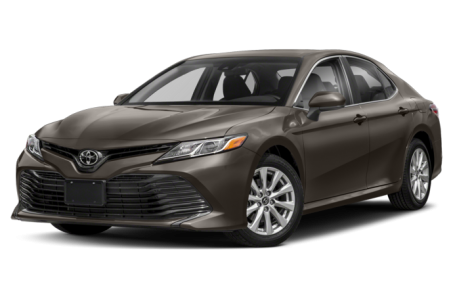 The Toyota Camry is a staple of basic, utilitarian transportation that's heading in a new direction for 2018 with a ground-up redesign that focuses on pumping up the Camry's attitude through enhanced driving performance and more aggressive styling. Six trim levels are available: the LE, SE, XLE, XSE, XLE V6, and XSE V6. Underneath the Camry is a new chassis Toyota says provides better ride quality along with more responsive handling and steering. Toyota didn't forget about practical-minded buyers and the 2018 model includes a feature-packed standard safety suite with forward collision warning with automatic braking, plus fuel economy is said to be improved. Toyota isn't exaggerating when calling the Camry is all-new. It's lower, wider and longer for 2018, and the wheelbase grows 1.9 inches. The hood is 1.6 inches lower than the outgoing car and the overall roofline is sleeker for a more attractive profile as well as better aerodynamics. Toyota designers intended for the Camry to have a more aggressive stance. The Camry's trim levels remain LE, XLE, SE and XSE. The SE and XSE trims gain their own appearance package with sculpted rocker panels, 19-inch wheels, a rear spoiler and unique bumper styling. Every seating position has been adjusted for 2017. The front seats are reengineered for improved ergonomics and foot room has been increased. The driver also benefits from a steering column with more adjustability and Toyota says the backseat is roomier with improved ergonomics. The dashboard is completely restyled with a more compact instrument cluster. A lowered beltline and dashboard aim to improve outward visibility. The cabin features soft touch materials on the dashboard, instrument panel, center console and door trim, while accent stitching is used on the front and rear seats. A new multimedia system called Entune 3.0 debuts in all models featuring Scout GPS, a mobile GPS application that projects to the Camry's main media screen. Entune 3.0 also features in-car Wi-Fi with 4G LTE and an available Remote Connect app for remote start, door lock and tracking capabilities. The biggest news under the hood is way under the hood with the Camry's all-new structurally enhanced chassis. The Camry's underpinnings are part of a new architecture with more ultra-high-tensile steel and new construction techniques to improve rigidity. Strengthening a vehicle from the ground up is often a change felt throughout the driving experience, as handling and steering responsiveness are increased while ride quality and noise characteristics are also improved. Toyota is promising all of the above, and made similar strides when the Prius switched to its new chassis using the same design philosophy. Both engine options are new to the Camry for 2018. The base 2.5-liter four-cylinder is all-new and pairs with an eight-speed automatic transmission. Power and fuel-economy numbers aren't available at the time of publishing, but Toyota says the standard engine will be more powerful, offer more torque and higher fuel economy — best in class fuel economy, according to Toyota. The optional 3.5-liter V-6 uses Toyota's D-4S direct fuel injection and pairs with an eight-speed automatic transmission. A Camry Hybrid will feature the new four-cylinder engine, CVT and revised next-generation hybrid system good for Prius-like fuel economy, according to Toyota; no numbers have been announced yet, however. The hybrid's battery pack has been repositioned for improved weight distribution to aid handling, and a new Sport mode adds a simulated fixed gears to the CVT to emulate a traditional transmission, plus improved acceleration from boosted electric power. An impressive suite of standard safety features includes forward collision warning with automatic braking and pedestrian detection, adaptive cruise control at all speeds, lane keep assist and automatic high beams. Available safety features are blind spot monitoring with rear cross-traffic alert and a 360-degree camera. Toyota says another upside to the increased chassis and body strength is improved occupant protection in an offset front or head-on collision. 57 of 61 (93%) consumers said they would recommend this vehicle to a friend.